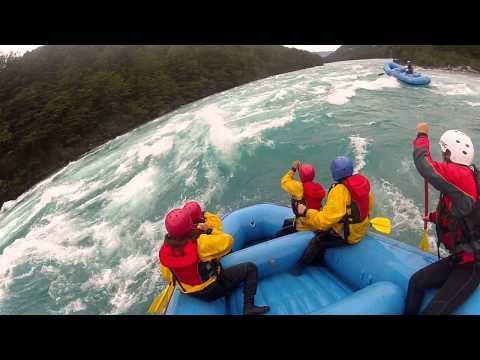 Activity Type: Intermediate level rafting in class 3 and 3+ rapids (in the summer). In the seven km course, there are large surface waves and holes generated by the current but no rocks. Distance: 7 km descent the Baker River. Seasonality: Three daily runs during the season of October – April: 10:00, 14:00 and 17:00. Special Considerations: Suitable for children 14+ and older with permission from their parents. Services: You can book directly with Baker Patagonia Adventure (BPA), by Email contacto@bakerpatagonia.com, through their web site www.bakerpatagonia.com, or in person at the office located by the waterfront of Puerto Bertrand. You can also coordinate your reservations with the Casa del Turismo Rural (House of the Rural Tourism), located in Coyhaique the tourist information kiosk alongside of the Plaza de Arms; (067) 2524929; www.casaturismorural.cl. Bertrand Lake is fed by the waters of Chile’s largest lake, the General, and returns the favor by giving life to the Baker River, the most powerful river of the country. At the meeting of these two giants of Aysén, there is a small, quiet town, almost completely protected from the stormy winds that descend from the Northern Patagonia Ice Fields. Puerto Bertrand’s charm and location have produced a small, close-knit collection of great cabanas, fishing lodges, restaurants and outfitters, who provide excellent opportunities for all kinds of excursions and expeditions in the sector. The town of Puerto Bertrand is home for a little more than a hundred people. Some are Patagones and the rest are relative newcomers who, quite rightly, have fallen in love with this small and secluded place. What attracts them? In part it’s the peace that comes from living among the native forests and crystal-clear waters of Lake Bertrand, but above all, it’s the pride that comes from living so close to the Baker River, with its unique turquoise waters, powerful flows, and excellent fly-fishing. The location of the village makes it a great starting point for excursions and expeditions into the interior valleys and glaciers that descend from the Northern Patagonia Ice Fields. Whether you prefer hiking, horse treks, adventures on the ice, or kayak expeditions, Bertrand is your place to start. While in Bertrand, explore and discover its hidden gems. There are several local artisans who offer traditional crafts, especially hand-woven textiles, and if you’re here during the third week of March, you can be part of a lively festival that attracts people from across the region to celebrate the anniversary of the pueblo; dancing the “chámame”, a Patagonian classic, and other popular dances like the ranchera and the cumbia. During the celebration, the town sponsors one of the oldest and most important fishing tournaments of the region, attracting fly-fishing fanatics from all over the world. Living in Bertrand and exploring the sector’s forests, rivers, and lakes, provides local guides with the knowledge and expertise they need to share this amazing place with visitors, and a special sensitivity for their natural environment that is contagious. With luck, you will have the opportunity to have local guides leading your excursions; and if you do, listen attentively and absorb their wisdom; perhaps your experience in Patagonia will turn out to be much more than a simple trip. As we mentioned earlier, the Baker River begins in the southern end of Bertrand Lake and transports a tremendous freshwater flow from the Northern Patagonia Ice Fields to the Fjords in Tortel. Its color is one-of-a-kind, thanks to the glacial sediments that provide the intensity of its turquoise and (depending on the section), a clarity or cloudiness that is equally intense. 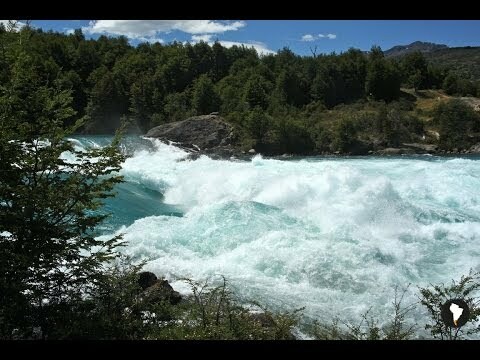 The recognition of this river as “the most powerful in Chile” makes it sound pretty intimidating; however, several of its sections are perfectly apt for kayaking, fishing and rafting. And this last sport, rafting, is our proposal for this adventure. 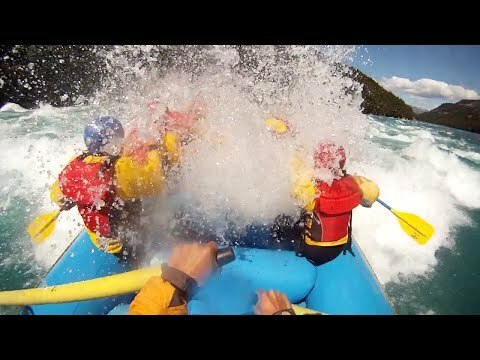 Rafting provides the unique perspective of being in close contact with the river and feeling part of the movement of the waters. This seven kilometer decent begins at the headwaters in Puerto Bertrand. After the guides from Baker Patagonia Adventure (BPA) provide you with safety gear and instructions, you’ll load up your rafts for the fun. BPA provides neoprene wet-suits and booties to protect you from the glacial cold waters (12 °C in summer), life jackets, waterproof wind jackets, helmets and, of course, your oars, because in this rafting, you’re much more than a mere passenger. Once on the raft the excitement begin immediately; a short 400 m into the trip, you’ll be challenged with the first rapid, which is categorized as 3 - 3+ during the summer and called “El Potro”, (the colt) because you’ll be thrown around like a rodeo rider on a wild horse. A little further down you’ll confront the “Reservada”, (reserved) rapid named for those colts that are reserved for only the best riders. The large waves in this section will make your five meter long raft seem little more than a tiny leaf being playfully tossed along in the water. After the wild ride of the rapids, you’ll reach a calm stretch that provides you with the opportunity to float for a while and observe the colors of the landscape and the incredible ecosystem of the Baker’s basin. If you’ve worked up a thirst, dip your hand in the water and drink up; this is a good opportunity to enjoy the clean waters of the River, some of the purest in the world. If you dare, you can even take a swim alongside the raft. The trip ends on a beach, where the BPA support team will be waiting for you with dry clothes and a snack. Don’t forget to take a few photos with your travel companions so you can show off the incredible accomplishment of rafting the waters of the Baker, one of the most respected and admired Rivers of Patagonia. The history of the Chacabuco Valley has intertwined nature and human for millenniums. First, hunter-gatherer tribes roamed the area in search of food and refuge. Later, ranching consumed almost the entire length of the valley with an enormous Estancia spreading across 70,000 hectares! Today, a new chapter is being written and the protagonists of this story are conservation and sustainable tourism.